That's why I could never understand why Yahoo doesn't take it more seriously. The groups feature seems to have been put in place and mostly forgotten about. And until recently I didn't get why users don't seem to really use the features offered. In most of the groups I've seen - and I've seen several hundred - the discussion area is run over with spam and long since abandoned, and the links page likewise. 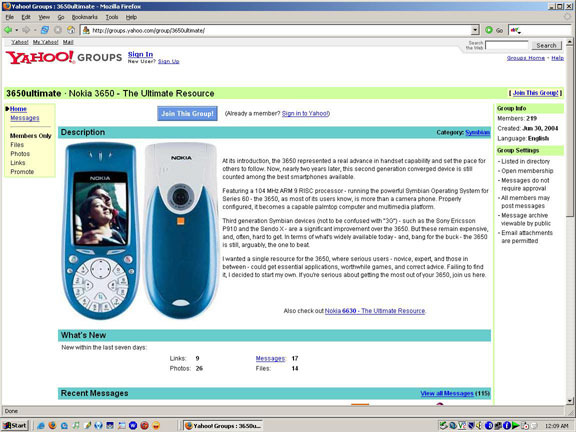 It seems as though serious groupings - such as, for instance, the official Symbian and N-Gage folks, as well as those groups devoted to people such as avant-garde filmmaker Maya Deren, all of which were Yahoo groups at one time; it seems as though such groupings try Yahoo groups and then move on - in the above examples, respectively, to their own webzine, to Google groups, and to an independent server. Anyway, to make a long story short, I couldn't understand why all this potential - these neat group tools - should go so mysteriously underutilized, so I decided to start my own groups. And I did, back in June. Both groups were dedicated to Nokia devices, one to my beloved 3650, the other to the (then) just announced 6630. Glad I thought to make screen shots of them. I went to no end of time and effort creating and maintaining these groups - creating files of various kinds, tweaking this and that, facilitating discussion, recruiting new participants, and so on. The effort was ongoing and, as of yesterday, had met with considerable success. Developers, engineers, mobile execs, journalists - and enthusiastic mobile users - from Europe, Asia, North America, and elsewhere, were part of each group. What I liked most about this was that we were all there with a common purpose, and equal in that. That was yesterday. Today I got a curt email - strictly boilerplate - from Yahoo. According, it said, to a complaint received, I'd violated Yahoo's terms of service. No indication as to which term of service, though. The email warned that if another complaint was received, they'd terminate my account. Of course, I immediately went to check my groups - only to find that the more popular of the two - the group dedicated to the 6630, with about 1500 participants - had been deleted. My response to this was to delete the other group, as well, followed by my own Yahoo account. I'm frankly ambivalent about so-called cracked applications. And that - cracked applications - very likely figures into this. There was a cracked app or two in the 6630 group, and I suspect one of the more recent joiners - probably a developer - complained about it. Of course, it could have been someone else. It could have been one of the innumerable spammers I chased off, or someone from a self-styled rival group. It might have been that fellow who kept sending announcements about his new forum. I told him we were glad to hear of it and wished him luck - but that any more than one announcement in a week's time was SPAM - then deleted the last two he'd sent. Hell, group messages were available to the public, even via RSS, so it could have been anyone at all. But the point is, Yahoo's strictness about their "Terms of Service" is a JOKE, and not a very good one at that. 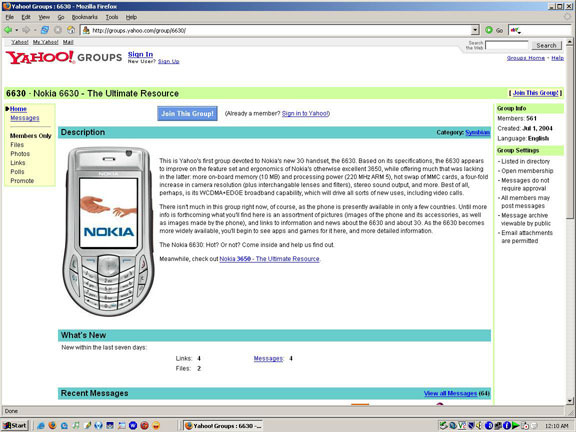 If you do a search of their mobile-related groups - using such strings as "symbian", "nokia", "sony ericsson", as well as the model numbers of various devices, you turn up well over a thousand groups - at least. Each of these groups, almost without exception, is nothing more than a repository for cracked applications. And spam. Try it. There really isn't any group quality to these groups at all. But you can find, gratis, any application or game you ever thought about maybe wanting, and a great deal more besides. Nor am I telling tales out of school here. Everybody in the mobile world, from the executive to the developer to the most casual user, knows about this - if they've bothered to do any looking at all. And it isn't just Yahoo groups. There's a plethora of forums and sites offering up the same material, in the same way. All it takes to find them is a simple search engine query. And never mind IRC, which is a haven for such things, so I'm told. Clearly, this is an implicit part of the business model for companies like Nokia. And you can see why - it drives enthusiasm for, and sales of, their products. I'm not so sure that, in the aggregate, it's bad for developers, either, as it does the same for them. That's why I'm ambivalent about it. In my own case, the use of a few cracked applications has led to my purchase of software. I never mind paying for software, if it seems worthwhile. But back to Yahoo groups. I think people don't use all the tools in the groups because of the jangling, jarring advertising encountered there. This is especially true today, when they have the Google model to compare it too. Sad, because Google's group interface, while pleasantly devoid of overbearing advertising, is noticably deficient in features. The obnoxious advertising in Yahoo groups is the reason I've heard most people give for wanting to go elsewhere. I was willing to put up with it, but it certainly didn't facilitate spending time in the group pages, and led to a nagging sense that I was thought stupid by Yahoo. When you couple this sense with Yahoo's ham-handed way of dealing with complaints and "enforcing" its terms of service, you're left with the very real feeling that Yahoo groups isn't the place for any kind of serious work, but rather a place for adolescents and those who are developmentally arrested. Which probably accounts for why, when the going gets serious in a Yahoo group, the serious group gets going elsewhere. If it isn't deleted first, that is. Some obvious things Yahoo could do to reinvigorate its groups: Turn the email list in the groups into a PHP-like forum, or maybe a group blog; add tagging, so that various groups could more easily link to each other; communicate with group owners - I'd have been happy to delete anything that was objectionable, had it been brought to my attention; change the advertising to something a little more subtle. If Yahoo did some of these things, they might find the overall caliber of the groups improves considerably, along with the company's relationship with its users. As it stands, everything at Yahoo groups, after a time, shouts AMATEUR HOUR. And I've thought this for a long time now, not just since this morning. Yahoo really needs to devote some effort to FIXING it. Or else delete it altogether, because right now, it turns off more people than not. And this from one who tried to make some part of it worthwhile.